Solar swimming pool heaters work extremely easily. The swimming pool pump sends your pool water through a set of black-colored panels. Each panel has small pipes that gather solar heat and transmit it to the water. When the water departs the set of panels, it is significantly warmer. Return pipes transmit it right back to your swimming pool. 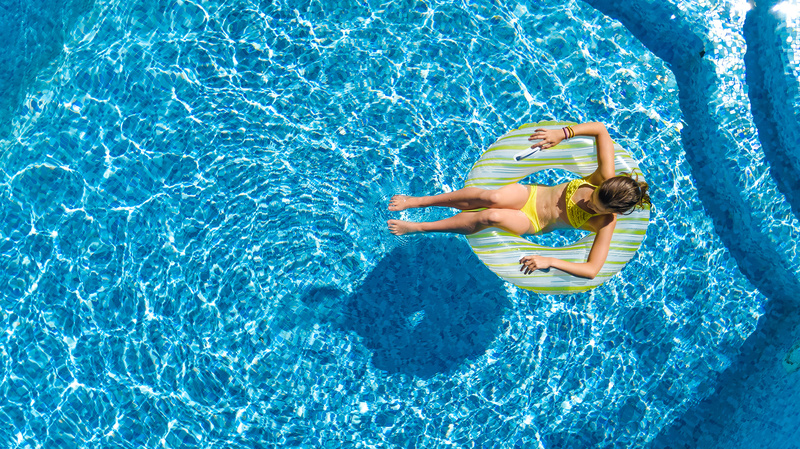 A thermostat directs this process to make certain your temperature remains right where you like it, even cooling your swimming pool by pumping water at night. Solaron installs the panels exactly side-by-side in a low-profile array with no ugly hoses or clamps. The panels are aerodynamic and do not need to be strapped down, adding to their low-profile look. Solar panels work on various roof treatments and orientations. Solaron is experienced at investigating each swimming pool and roof to maximize performance and efficiency. What System is Used by Solaron? Solaron has served El Dorado Hills since 1994! We are pleased to be a family owned and operated business and believe in customer service, trained employees, and bringing you the best modules on the market! Solaron is pleased to be an Authorized Heliocol Distributor. Heliocol is the leading swimming pool solar business worldwide with the best product warranty. Solaron is and has been the largest California Heliocol dealer since 2010. Our sales and installation employees receive ongoing support and training from Heliocol. We do our own installations, using our own employees. Fully insured and licensed, Solaron has never had a negative report with the contractor’s board and has an A+ rating with the Better Business Bureau. The Cost of Solar Panels Has Dropped!